Prof. Vasil Nikolov from the National Institute and Museum of Archaeology of the Bulgarian Academy of Sciences, who has been the lead archaeologists of the Late Neolithic and Chalcolithic settlement near the town of Provadiya in Northeast Bulgaria since its discovery in 2005, has revealed that samples from skeletons found in the settlement, a major producer of rock salt in the 6th and 5th millennium BC, have been examined in a laboratory of the Natural History Museum of Denmark. The analyses have yielded “surprising” results indicating that the people who inhabited Europe’s oldest prehistoric town in the 5th millennium BC did consume milk. “Until recently, we thought that the [consumption of milk] happened at a considerably later stage because it was believed that the human body could not absorb raw milk… [These people consumed] milk from domesticated animals, not from wild animals. These people were stock breeders but for a long time it was thought that they used the animals only for meat,” Nikolov has told the Bulgarian private news agency Focus in an interview. 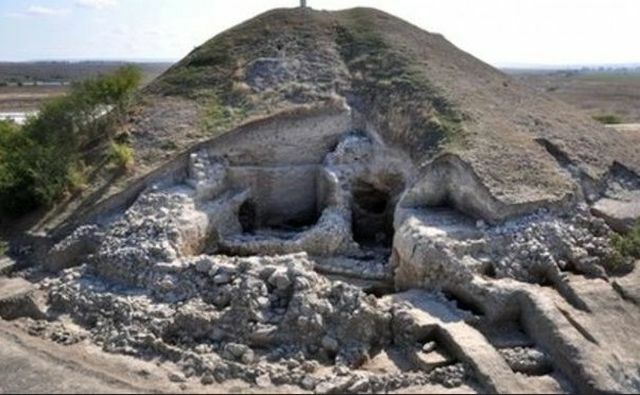 He adds that further analyses are to reveal whether the prehistoric inhabitants of salt-producing prehistoric town near Bulgaria’s Provadiya also consumed yogurt, and/or some other kind of milk products. In his interview, the archaeologist also explains that the prehistoric town near Provadiya had “one of the earliest” fortresses whose walls are being unearthed further during the ongoing 2015 summer archaeological excavations. “Last year, we revealed ruins from the fortress near Provadiya but now we are gradually reaching the foundations. It is extremely interesting. It is 6,500 years old, one of the earliest fortresses. Before it, there was another fortress, about 200 years older, which is the earliest one. The two came one after the other but were in the same settlement. The wall is well preserved in long sections. There are two such sections of 50-60 meters each, and we have so far unearthed about 140 meters of the wall. This is about half of the total,” Nikolov elaborates. “It was a closed fortress. By saying that I mean that it was the earliest closed fortress wall because from the same period there are singular fortress walls used to close off a peninsula. For example, Nessebar was a closed isthmus… For the first time, this was a plain region fenced off with a round wall, and a rather thick one, too, as it was more than 3 meters wide in its base, and at least 5 meters tall. This was something incredible in the middle of the 5th millennium BC,” concludes the Bulgarian archaeologist describing the prehistoric fortification near Provadiya. Europe’s oldest prehistoric town was first excavated in 2005, and has been studied ever since, by lead archaeologist Prof. Vasil Nikolov and Assoc. Prof. Krum Bachvarov from the National Institute and Museum of Archaeology of the Bulgarian Academy of Sciences .